Shabbychick Junk. : Enjoy life, it's delicious! I'm coming up for a breather tonite from sampleland to show you what I was up to last night. I got the brand new Crafty Secrets "Sweet Stuff" set in my hands and started making samples for the trade show booth for Crafty Secrets! Sandy decided to release this set early, since it has a cute little heart and cookie cutters that would be PERFECT for baked valentines day treats! You can read all the details on which sets were released on the Crafty Secrets blog HERE; they have 5 CHA sets that have already arrived this week & are available to order! 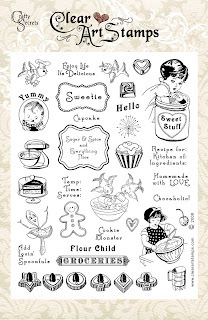 Here's a photo of the new "Sweet Stuff" Large stamp set. You can see more of my samples and all the sets & details on the Crafty Secrets blog HERE. 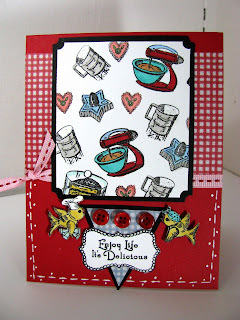 I used the sweet little chef birdies to hold up a mini banner on this card that says "Enjoy Life, It's delicious". I also created my own patterned paper by using some of the fun elements from this set like the heart cookies, retro mixer and the flour sifter! OH I LOVE THIS SET!!!!!!! I love all of your Craft Secrets cards LZ! You always amaze me! such a cute set...love what you did with it! Have fun at CHA. Girlfriend ... you are really burning the midnight oil with all these gorgeous samples! Your coloring really makes these awesome new sets come to life!! GREAT job!! This set is amazing, and your samples rock! Had to order Sweet Stuff right away! 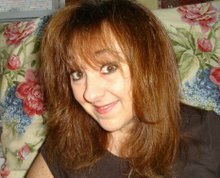 Don't always comment, but subscribe, and love your blog, thanks for frequent inspiration!